One of my favorites is brats and cabbage. Can't find the recipe online but the book it came with has this. Bring all this to a boil and lower temp when it starts to steam and cook for an hr. Dump it all in foil pans and pig out!!!!! Italian chicken dinner is a good one too. Oh man. I might have to get one of those. How tall is it? I usually have to cook for a crowd (10-15 people) and it would be sweet if I could get it all in one cooker. Best part is cleanup is a breeze with only 1 pot to clean. Sold! We are doing a big get together this weekend. My local Bass Pro has 2 in stock. I'm popping over there after work to get one. Thanks for the tip on this thing. I have been reading (i.e. drooling) over some of the recipes all morning. 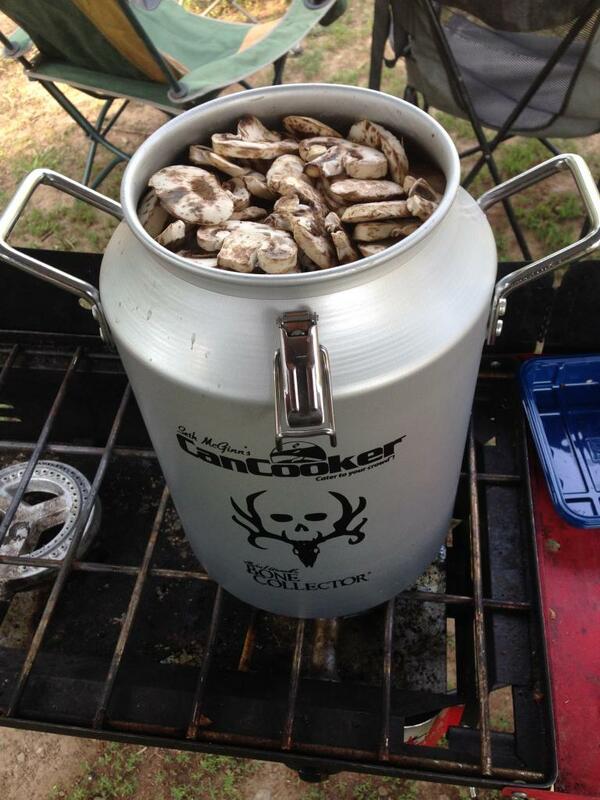 Always wondered how these things cooked...don't see real world feed back much from campers. Might need to add this to the arsenal. Is it more or less a pressure cooker? Brief summary on the can cooker's first workout. 3 lbs Chicken tenderloins, heavily dusted with lemon pepper. we decided not to do shrimp this time and the wife forgot to buy shrooms. Clamped on the lid, put it on my rocket-burner camp range, and put a penny over the vent hole. When the steam moved the penny, I turned the heat down to medium, and set the time to 1 hour. The result? OMG! The onions practically liquified in the beer, very soft and translucent. The potatoes and peppers were perfect. Soft, but not 'mushy'. The carrots were good enough that I had quite a few, and I really don't like carrots at all. The corn was just the way I like it. Very hot and crisp,not overcooked or mushy at all. The Kielbasa was as good as any I have ever had. Well cooked, flavorful and juicy. The chicken was good as well. Of course, you cannot brown chicken in steam. I prefer a bit of brown on my chicken, but the flavor and juicyness were spot on. I had the can pretty much full and fed 6 adults, 4 teenagers, and 2 pre-teens, with a bit left over. Lessons learned: More green/red peppers. I did not know who all liked peppers. Turns out everyone did. I might try to brown the chicken a bit next time before I put them in. Or maybe afterwards on the grill. I'll have to play with that a bit to see what works. Also... one can of beer is plenty. I was worried that it will all steam off, but there was still enough liquid in the can to put out a good jet of steam from the vent hole even after an hour. My verdict. Shut up and go get one. No. It does not 'build pressure'. It has a vent hole that constantly shoots steam out of it while cooking. It does 'steam' your food, rather than boiling it. Mostly good reviews. Some complaints about the aluminum thickness being too thin for camping uses and leakage around rivets. Various prices at the usual outlets.